Every culture has its legends, its stories, its myths and beliefs. Some of us believe these as historical truths and some do not. Some of us see these as ancient people trying to make sense out of their world and some of us see these as detailed historical accounts. But if we believe or not believe, and the question of how we see the world, or history, does not really have an immediate, tangible effect on our physical existence. In other words, our beliefs do affect us but only as we perceive the world; it shapes our views and our lives. The very fact of believing or not does not have any direct impact on us. You can choose to believe in Santa Claus, this will not have any negative direct effect on your life. You can choose to believe that only you have a ticket to heaven, this may offend some but again, no direct effect on your life. But if you chose to believe that a martial art is effective, and this is a false belief...well, this is where your false beliefs will really get you into trouble. In this day and age of internet and FaceBook and forums it is easier then ever to promote bad martial arts. Everyone is a "grand master", everyone is the best, everyone, from the comfort of their laptop, can create an impressive website that makes them look like the Krav Maga master of masters. Never has it been easier to be a fake. I travel the world and put my Krav Maga to the test daily. I do this not by getting into bar fights but by teaching veteran instructors of other styles and asking them...now you try it, do not do it because Moshe Katz said so, do it only if you personally have come to believe in this and trust it. The results speak for themselves. Police, military and Krav Maga instructors all over the world have adopted our IKI style of Krav Maga. Our directness and simplicity have stood the test and won many "converts". We do not perform miracles, we do not claim lineage from Great and Powerful imaginary masters, we just show the techniques and say..now you try it like your life is on the line, because some day in just may be. When that day comes, when your life is on the line, and you need to rely on Krav Maga for your survival, the truth will come out. False beliefs will be shattered, idols smashed, great "gods" will be of no avail, "eyes they have but cannot see, ears but they cannot hear", the "masters" from Facebook will have failed you in a moment of truth. The facade will come crumbling down. Believe what you want, for years people believed in stone idols, in the sun god, in human sacrifice, in flying rain-deers, flying donkeys, and...you know the rest. But when it comes to self defense, it is best to put "beliefs" aside and rely on what you can prove to yourself. Stories of "grand masters" and movie-like heroes are great for camp fire stories, the "my teacher can leap over tall buildings while kicking five bad guys" is all fine while drinking a beer with friends, but when it comes to reality: it is best to get real. IKI Krav Mag Tour and Train participants with members of the Jerusalem Border Police. read the e book on Kindle, over 250 pages, history, real life cases, the origins of Krav Maga. 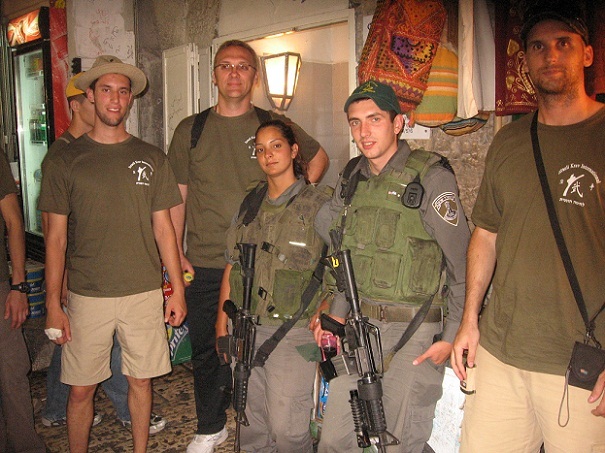 Learn about Israeli security and our everyday heroes.